A friend and fellow writer, Patry Francis, is making her paperback debut this week with her wonderful novel, The Liar's Diary. Patry was recenyly diagnosed with an aggressive form of cancer, but her prognosis is hopeful. Needless to say, she won't have much of an ability for promotions, so a number of writers who are also bloggers have agreed to help. A complete list of all the bloggers, authors, editors and agents who are helping with this cause can be found at the Backspace homepages. Read more about this couragous author at her website, or at her blog: Simply Wait. 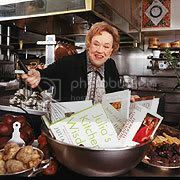 I'll tell anyone who'll listen (and you all know who you are) that my personal idol and hero is none other than the late, great Julia Child. And for over 30 years, Julia chopped, diced, and whisked her way to the top of the gastronomic charts through her TV cooking showcases, teaching millions of home chefs how to get the lumps out of a roux, keep soufflés from falling, and give volume to egg whites. Julia loved the basics, the hows and whys of cooking, taking out the mystery but sharing the mystique. No doubt, this was because she came from the pre-Martha Stewart /Rachael Ray "30 minute" era, well before microwaves, bread machines, food processors, sammies, and nonstick frying pans. 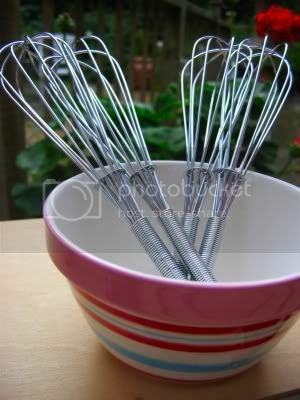 Julia Child introduced whisks (or wire whips, as she called them) to American kitchens in the 1960s, and we've been mesmerized ever since. These babies are multi-tasking utensils that can aerate, emulsify, deglaze, and mix. Even though anyone who's been to their nearest Williams-Sonoma for a whisk recently knows that they come in an overwhelming array of designs these days. But in an exclusive slideshow, Gourmet Magazine demystifies the wide World of Whisks. Well, even if you do, at first glance you'd still probably think this was the real thing. 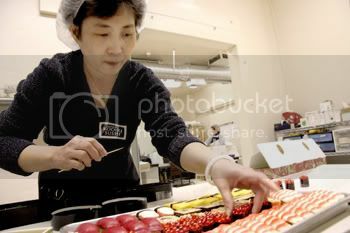 But the real fact is, it looks like sushi... but it's not. The glossy looking salmon roe is really apricot flavored gummi eggs, the shrimp is made of white almond filling and has green tea in place of wasabi, the egg omelet is lemon meringue filling tied with dark chocolate. 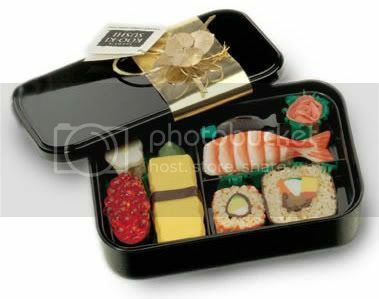 What appears to be sushi rice, is a cookie made from popped rice and even the little soy sauce container is really chocolate. And, just in case you were wondering, yes, they've also created sushi-style "tableware" made from chocolate, including a flavored line of chopsticks and gorgeous sake cups. Talk about a little Sushi "ingenuity" at its finest. Read more here about how Karen "Suedy" Sasaki and her sister, Janice Murai, stumbled upon this unique idea that actually stemmed from an ad for a national magazine's holiday cookie contest. With chocolate vendors gearing up and Valentine's Day soon upon us, no one can speak better on the subject of pairing wine with chocolate than my good friend and award-winning wine expert, Natalie MacLean, author of Red, White and Drunk All Over: A Wine-Soaked Journey from Grape to Glass. 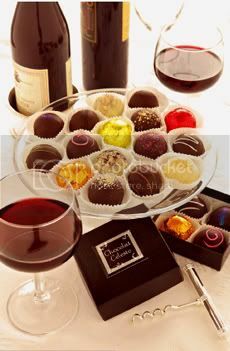 The creamy flavors of chocolate go best with sweet, full-bodied, high-alcohol wines, Natalie also notes. She suggests wines to compliment 50 chocolate dishes in her online matching tool at www.nataliemaclean.com/matcher. Just click on “desserts” to find pairings for chocolate mud pie to chocolate cheesecake. Natalie’s online food-and-wine matcher doesn’t just focus on chocolate. The interactive tool has thousands of wines to pair with any dish: meat, pasta, seafood, vegetarian fare, pizza, eggs, cheese and dessert. You simply choose the food or wine from a drop-down menu to get the pairing suggestions. There are also lots of recipes for those planning a romantic meal. The matcher is updated regularly with new dishes and wines from the 83,000-plus readers who subscribe to Natalie’s free e-newsletter, which offers tips on how to buy, cellar and serve wine. In Red, White and Drunk All Over, Natalie discusses how to match food and wine in greater depth, including wines for a multi-course dinner. There’s also a chapter with advice on pairing wine with five challenging foods: chocolate, cheese, spicy dishes, vegetables and fast food. Got a dish or a wine to stump Natalie? Just e-mail her via her website Nat Decants and she’ll suggest a match for you. Thanks, and all best, Nat. Anyway, Jamie Oliver is back doing what he does best -- cooking, at home, with simple, accessible ingredients, including fruit and vegetables grown in his own garden. This latest Food Network effort is called, Jamie At Home. Each episode is themed around a primary ingredient, ranging from a variety of different peppers; what you can do with mushrooms; and how to cook assorted game fowl. 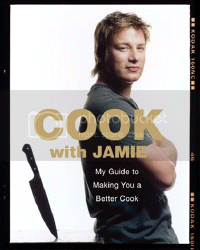 You can catch Jamie Oliver's new series on the Food Network premiering on Saturday, January 12 at 9:30 pm EST. Filled with simple, everday recipes, Oliver exhibits a conversational approach that often calls for a "knob of butter," a "handful of shelled peas" or "a big handful of freshly grated Parmesan." A friendly and familiarizing approach that clearly deflates any nervous cook's initial hang ups or anxieties.